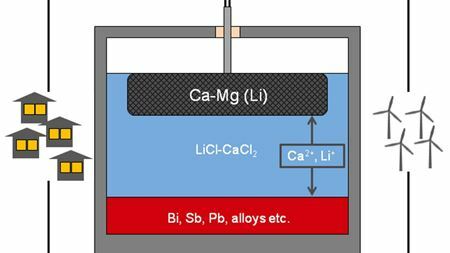 Making a viable liquid metal battery with calcium and magnesium. Taiwanese researchers suggest that graphene’s high thermal conductivity could further improve the lifetime of LEDs. Scientists have developed a new method for making single crystals from glasses and other solid materials with disordered atomic structures. New spintronic device with sandwich-like insulation. New process for using atmospheric CO2 in environmentally friendly battery electrodes. Property of organic semiconductor molecule could improve device efficiency. Novel devices that produce electricity from pulses of heat traveling along carbon nanotubes can generate as much power as today's batteries. The vibrations of the outermost atomic layers at the surface of a nanomaterial are comparatively large and play an important role in how it behaves. Scientists have used a helium ion microscope to control the conductivity and distribution of ferroelectric domains on a 2D material. New excitonic devices made from the 2D materials molybdenum disulfide and hexagonal boron nitride can control excitons at room temperature. Graphene can transmit high frequency electrical signals without energy loss, outperforming any other known material, including superconductors. A new machine learning tool can predict a theoretical polymer's electronic properties from its atomic configuration. Low-frequency Raman spectroscopy can characterize the patterns produced when 2D materials are stacked on top of each other and twisted. Scientists have shown that the fungus Neurospora crassa can transform manganese into a composite for use in lithium-ion batteries. By combining microscopy and theoretical calculations, scientists have studied the properties of a promising next-generation energy storage material. By synthesizing highly pure crystals, scientists have overcome a practical limit on the efficiency of cadmium telluride solar cells. Scientists have shown that carbon nanotubes produced from atmospheric carbon dioxide can form the basis for battery electrodes. Scientists have discovered a new one atom-thick material made from silicon, boron and nitrogen that is stable and semiconducting. Infrared boost for the digital world thanks to plasmonics. A new surface for controlling infrared plasmons could form the basis for faster, more efficient ways of transmitting massive amounts of data. Scientists have found a way to fabricate a novel 2D heterojunction by bringing together graphene and gallium selenide. Scientists have zoomed in on the quantum phase transition that could explain why copper oxides are high-temperature superconductors. Scientists have come up with a way to increase the conductivity of two novel electrode materials for lithium-ion batteries. Scientists have developed two new sustainable electrode materials for sodium-ion batteries. A material made of carbon nanotubes and copper oxide nanocrystals can use sunlight to split carbon dioxide and water into green fuels. For the first time, scientists have observed electrons in graphene behaving like a fluid. A one-atom-thick layer of tin monoxide is the first stable P-type 2D semiconducting material ever discovered. Scientists have developed a way to fabricate atomically-precise two-dimensional superstructures out of the nanocrystals known as quantum dots.